Who doesn’t like a good ol’ fashioned film where they make you wonder if you’re completely bonkers and losing your mind? Otherwise known as psychological thrillers, these movies fascinate and inspire the brain – and work it all night making you think about things you wouldn’t normally think about. Take Shelter is a film that does a remarkable job at keeping things fresh and imaginative – and it never once sinks into the unfortunate demise of predictability…it is quite simply – fascinating. 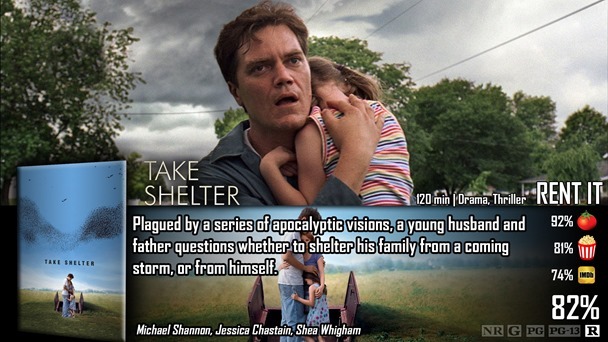 Alrighty, so Take Shelter is about a chap named Curtis, played by Michael Shannon, who keeps having these premonitions of sorts that seem to hint towards a horrible storm that’ll change everything. These dreams and hallucinations drive him mad and give him night terrors that he cannot handle, so he begins seeing a therapist while he takes comfort in the storm cellar he keeps in the backyard. As the delusions continue, the more he expands on the storm cellar – using money he didn’t have and risking everything because even though he thinks he might be crazy – there’s still that slight probability that all this could be true. So I’m going to address the elephant in the room. The plot and concept of this film is very reminiscent to another very popular story that we’ve all heard before – Noah’s Ark. In fact, a lot of what they were trying to do in Noah was the same things they were attempting to do in this film as well. Basically – this could all be a sign from God, but instead of literally hearing his voice – what are you more likely to get? Visions that would make you look crazy. Now, there is no mention of God in this film whatsoever – but anyone watching it could probably make the distinction between the two stories. So I wouldn’t necessarily call it a completely original movie, but the direction it took did take a lot of creative thought…so there’s that. I also want to point out that I haven’t previously heard of this film, but I am familiar with its cast. Michael Shannon really shines in the film as the man who does a phenomenal job at confusing his audience. Is he crazy or is he some kind of prophet that just appears crazy? The transformation his character takes is done really well, and the reactions given by his wife (Jessica Chastain) and daughter (Tova Stewart) are both equally as impressive. But the reason why I never heard of it before probably had to do more with promotion. This wasn’t a highly-promoted flick. 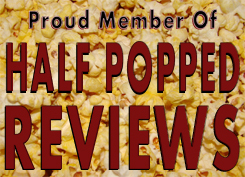 It had a relatively low budget and it gives off an independent vibe – and independent movies don’t get a lot of focus. However, most of that vibe just had to do with visuals – which weren’t always impressive. The special effects themselves weren’t so bad, but I felt as if the basic post-processing things like color correction were basically ignored. For those of you that know things about photography, the white balance more or less seemed like auto-white balance. Seems like nothing, but movies normally don’t do that for a reason…it’s just one of the unspoken rules in a movie that make it feel like a movie – generally speaking. I wasn’t pulled into the film as much as I probably would have been if they did everything right…take that as you will. Take Shelter is a really good psychological thriller that does a great job at showing man’s inner struggles with self – and how hard it is to tell your loved ones something you consider important, because it’s embarrassing or sounds crazy and unlike yourself. This really isn’t a bad movie and there isn’t a lot of bad to report other than technical problems with how the movie looked and felt after post-processing was finished. I didn’t think it felt as much like a movie as it should have…and that’s a shame. I watched this after a friend insisted I do so. I thought the whole sucked until the end, when [spoilers]! Great review. Brilliant move. It was one of my favorites from that year. Shannon deserved at Oscar nod but of course he didn’t get it.